When planning a weekend getaway, travel time matters a lot. Which is probably why Bangaloreans settle for places in Karnataka or Tamil Nadu rather than opt for destinations in Kerala. But one must never leave out God’s Own Country. There are plenty of places in Kerala that are just a night’s drive away. Leave on a Friday night and you’ll reach in time for your reservation the next day. Historical cities, scenic hills stations and beach-side retreats are all options. LBB finds the Kerala destinations that you can reach in 10 hours or less. Covered in endless tea plantations, Munnar’s breathtaking hills make for an ideal weekend escape. While Munnar is pretty popular with the tourists (especially honeymooners), much of its beauty remains intact and, therefore, is a must visit. You can spend your time here simply lazing around while soaking in the mist-covered hills, the waterfalls, and the estates. Or you could explore the sights and sounds of the hill station, including the Eravikulam National Park, spice plantations, and a tea museum. You can discover more here. A historical, port city, Kochi was once a thriving hub for the spice trade. Today, you can discover its rich past with a quick weekend getaway. Once you get here, you can park yourself at one of the many heritage homes here. Or, if you are on a budget, a quiet homestay. At the seafront, you’ll see the famed fishing nets from China. And, in the interiors, you can visit a Jewish synagogue that’s over 400 years old as well as age-old temples and mosques. Forts, palaces, and museums are also part of the city’s makeup. Kochi is also a great place to try out Kerala’s delicious cuisine, by the way. Kannur may not be at the top of every tourist’s itinerary in Kerala but that’s exactly why you should head there for a quiet weekend away. There are plenty of beach resorts that are not just equipped with all the facilities but come at a budget price when compared to elsewhere in Kerala. Kannur is perfect for when you don’t want to do much but laze by the sea. However, if you insist on getting out, the St. Angelo Fort, Payyambalam Beach, and Arakkal Museum should keep you occupied. You can also drive to the town of Thalassery for their famed biryani. Venturing out to discover the Malabar Coast? Then, Calicut (or Kozhikode as it is now known) should be your first stop. History books will tell you that Calicut was once known as the City of Spices. It attracted traders and explorers from around the world, including, the very famous, Vasco Da Gama. For many centuries, Calicut was ruled by the Zamorins, the powerful Hindu Eradi rulers. And they have left their mark on the city. The Mananchira Square and the Thali Shiva Temple are a must visit here. There are also beaches and bazaars that are worth exploring. A picturesque hill station near Palakkad, Nelliyampathy isn’t overcrowded by milling tourists and remains largely unspoiled. While there isn’t plenty to do around, you can spend your weekend taking in the serene beauty of the Western ghats and explore the town’s many plantations and bio-farms. Parambikulam Wildlife Sanctuary is also close by and you can swing by to discover its rich wildlife. Looking for an unspoiled beach to spend the weekend? Then, head to Bekal. The white-sand beaches, around here, are inviting, undisturbed and gorgeous. 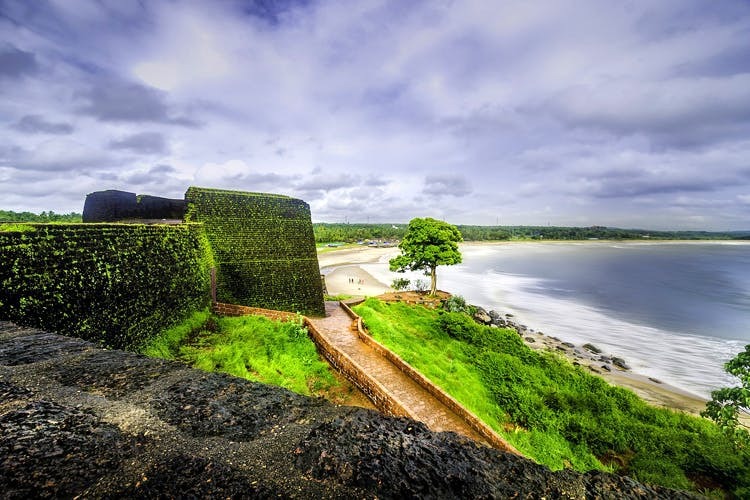 The Bekal Fort (it’s the one featured in Tu Hi Re from Mani Ratnam’s Bombay) that sits on a the town’s beach affords a beautiful view of the sea. You can also skip to the nearby Kappil Beach for a slice of serenity. However, do note that Bekal is largely occupied by 5-star properties. So, if you are looking for budget accommodation you may have to settle for options in nearby Kasargod. Easiest to reach, Wayanad promises plenty. Wildlife, waterfalls, scenic hills and plantations are all part of the mix here. You can cosy up in homestays or opt for hotels (range from budget to fancy) that have popped up all over the district. Since the district is pretty vast, you may want to stay somewhere close to what you are looking for. You can stay by the Wayanad Wildlife Sanctuary if you’ve got safaris on the itinerary. Neelimala, to the southeast of Wayanad, is popular with trekkers. And Lakkidi is perfect if you want to laze away at a gorgeous plantation homestay.